I am a flying fox, one of two known to occur around here. I’m actually kind of like you, I like a home that is safe, familiar, and close to where I get food and socialise. After a long night of foraging for flowers and fruits in our forests and wetlands I like to retire to a safe place. There are two types of flying foxes in Townsville and they are both Australian native animals. Black flying foxes are permanent residents and the largest and the most common type in this area. They stay year round, but move from camp to camp. Black flying foxes love to eat fruit, pollen and nectar. Little Red flying foxes are the smaller of the two and mostly eat nectar. They visit Townsville as they travel up and down the east coast of Australia, kind of like “red nomads”. They come in small or very large groups and stay for a few months when their favourite nectar trees are flowering. in our botanic gardens (which can seem to them like the ultimate flying fox resort). The Department of Environment and Heritage Protection ensure the protection of flying foxes under the Nature Conservation Act 1992 and relevant regulations. Council does its part for the urban colonies through a number of management plans. 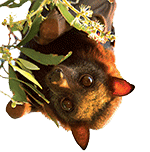 Flying foxes can carry the Hendra virus and the Australian bat lyssavirus. Contracting a virus from a flying fox is unlikely. If you have been bitten or scratched by a flying fox, seek medical attention immediately. For more information on flying fox health visit Queensland Health or Biosecurity Queensland. If you find a sick or injured flying fox, contact North Queensland Wildlife Carer, RSPCA Queensland or Queensland Parks and Wildlife Service. Never handle an injured wild animal.